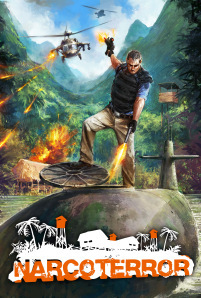 Today we bring you a new trailer for Narco Terror, a recently announced game from Deep Silver and Rubicon Organization. According to the press release, Narco Terror is "a sophisticated, action-packed twin-stick shooter that thematically harkens back to classic action movies from the 80’s and offers great diversity with several arcade gameplay sequences." That's good to know. Because when I think sophistication, I think 80's action flicks, and when I think diverse gameplay, I think twin-stick shooter. This may be the game of games, people. But don't take my word for it. Watch the video and decide for yourself. What's better than a one-man-army? Two one-man-armies! The game has all the co-op options two gamers could want, which would be two player local or online co-op. We don't know the name of Rick Quinn's partner yet, but man I hope it's Burt Macklin. I'd probably have to buy the game twice if that happened. I found this image on the Rubicon Organization site. Yes, that's superbadass Rick Quinn taking the rare opportunity to shoot into a submarine while blindly firing at a helicopter at the same time. That's like harpooning a whale while strangling a condor. YOU DON"T MESS WITH RICK QUINN! I'd also like to nominate Narco Terror as "Game most likely to be renamed by release day," seeing as how "narco" and "terror" yield some pretty unpleasant search engine results when used together. It's also the name of a 1985 Mexican action movie, so that's a thing. Narco Terror supports two player local co-op or two player online co-op. It will be available for download through the Xbox LIVE Marketplace, PlayStation Store, Steam, and other digital distributors this summer. Page created in 1.4764 seconds.